We’d love your help. Let us know what’s wrong with this preview of The Winter Players by Tanith Lee. She distrusted him at first, not least because she knew his words were lies. "Call me Grey," he said, but that was not his name. Fear gripped her like a hand. No one but the priestess could look upon the relics: the Ring, the Jewel and the Bone. It was for the bone that this grey stranger had come. He was like a thief, but she realized with a sinking heart that he was armed She distrusted him at first, not least because she knew his words were lies. "Call me Grey," he said, but that was not his name. Fear gripped her like a hand. To ask other readers questions about The Winter Players, please sign up. It astounds me that at just over 100 pages, Lee manages to erect an entire world, create an action-packed quest and construct such emotive and real characters. Her evocative and poignant writing meant that this book was a wonder to behold: each word was perfectly formulated for maximum impact and a sea of brooding and atmospheric settings were consistently created. Whilst reading this I managed to tune out the birds tweeting in the trees and could instead feel the icy wind biting my exposed fles It astounds me that at just over 100 pages, Lee manages to erect an entire world, create an action-packed quest and construct such emotive and real characters. Her evocative and poignant writing meant that this book was a wonder to behold: each word was perfectly formulated for maximum impact and a sea of brooding and atmospheric settings were consistently created. Whilst reading this I managed to tune out the birds tweeting in the trees and could instead feel the icy wind biting my exposed flesh and see nothing but the snowy world I became so enraptured in! Loved this Tanith Lee ... Legend. Why have I not read this before? I keep forgetting how good Tanith Lee is until I go back and read a new story of hers. "The Winter Players" is a short novel of a priestess' quest to recover a relic stolen from her by stranger. Her pursuit of the lost relic leads her on a quest where she discovers the true nature of her magic and the relics upon which the shrine she keeps is built. A lovely story, and one I would reread. Another beautifully written book by Tanith Lee, one that I have read and reread several times in the years since it was first published. It is an evocative and satisfying tale that can take you into an alternative world for an evening. Very much recommended. And then the whole circular she's her own ancestor? O_o And does it really mean anything or not? like this one jut don't remember when I read it a couple of years ago. Okey story. This is one of the first fiction published by the late, great Tanith Lee. It’s at an awkward length, at 104 pages, too long to be included in an anthology, too short to be part of a reprint series. That’s a shame, because it is a story that is just the right length to tell the tale the author wishes to tell. It’s a high fantasy tale, starring a young, moral, determined priestess and ….. hmmm, spoiler-free version ….. those protagonists that wish bad things for our heroine priestess and those she This is one of the first fiction published by the late, great Tanith Lee. It’s at an awkward length, at 104 pages, too long to be included in an anthology, too short to be part of a reprint series. That’s a shame, because it is a story that is just the right length to tell the tale the author wishes to tell. It’s a high fantasy tale, starring a young, moral, determined priestess and ….. hmmm, spoiler-free version ….. those protagonists that wish bad things for our heroine priestess and those she protects. I greatly enjoyed this story. It’s a good mixture of fantasy tropes and sheer originality. I've read this book some 15-18 years ago in Italian. I re-read it now. It feels like I read something completely different. My fuzzy memories about the book were "Oh nice!" and "Too bad the can't be together!". But probably they were related to a different book altogether. Jeez, I'm getting old. It would have been nice to compare the translation to the original though. Most of the books that belong to that particular series were adapted for a younger audience when they were published in Italy betw I've read this book some 15-18 years ago in Italian. I re-read it now. Anyway. There were some words I didn't know. More than usual if we consider that this is just 104 pages long. And the language the author uses, it was difficult to stay focused on the text sometimes. It happened a couple of times that I was reading and my mind was drifting away because of the way the novel was written. The time-travel part, then, was explained in a awkward way, I guess. Grey, a young thief, steals a finger bone - one of three holy relics from a sea-temple. The teenage priestess gives chase and has to contend with the evil sorcerer who has enslaved Grey. Tanith Lee is truly incomparable - in just 100 pages she creates an entire fantasy world with engaging characters and a plot where you truly have no clue what's going to happen. I love the mythic feel to this - it's like a fairytale... yet not based on any story you actually know. The characters almost feel like Grey, a young thief, steals a finger bone - one of three holy relics from a sea-temple. The teenage priestess gives chase and has to contend with the evil sorcerer who has enslaved Grey. Tanith Lee is truly incomparable - in just 100 pages she creates an entire fantasy world with engaging characters and a plot where you truly have no clue what's going to happen. I love the mythic feel to this - it's like a fairytale... yet not based on any story you actually know. The characters almost feel like tarot cards and yet are somehow real too. Towards the end this veers into SF with time travel and has a highly unusual but very satisfying conclusion. Love her use of unusual names - here the priestess heroine is called Oaive which is fitting since she comes from the fisher folk. 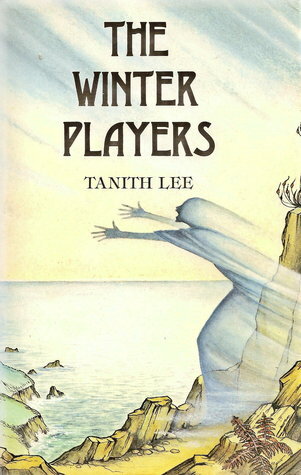 "The Winter Players" is one of my earliest Tanith Lee books, and definitely my favorite. Oaive is my first priestess in Western fantasy. It has an earlier motif of Narasen and Issak story in "Death's Master" in some sense. It's coming as a Kindle book on July 31. 6 more Tanith Lee kindle books are coming on the same day, and 3 came out on June 30, including my anothor favorite, "The Castle of Dark". The best time to start reading or re-reading Tanith Lee. Een kinderboek van Tanith Lee, meestal schrijft ze zeer volwassen fantasy romans, maar ze heeft ook een flink aantal kinderboeken (12+) geschreven. Dit vind ik een van de besten. Complex verhaal met magie, strijd, tijdreizen en de rol van vervloekingen en het lot. Aanrader voor iedereen die zijn/ haar kinderen wil zien opgroeien tot fantasy-minnende volwassenen. 3.5 stars. It has a simple story line. It works with one of the oldest Fantasy tropes: the adolescent, who finds out that she has huge powers. And then he uses these powers to fight a mighty foe (and.... you guess it). The characters are also rather flat. But it was a quick and pleasent read anyway. Kinda sweet, but didn't get emotionally attached to any characters. I've read and re-read this book when I was around 11-14 (in Italian). I loved the story the characters, everything: it was one of my fantasy-genre-starter and since it's a childhood reading, I can't say if my 5 stars are blind-children-love-5-stars or 5-stars-for-real. De inhoud van dit boek is gelukkig even mooi als het omslag afschrikwekkend is. Fraai geschreven, goed in elkaar gepaste scènes, interessante hoofdpersonen en vol sfeer: Tanith Lee op haar best, wat mij betreft. A re-read of a favourite Tanith Lee novel. Small and perfectly formed sums it up beautifully. This is my favorite Tanith Lee's tale. So beautiful, and a sweet pain.